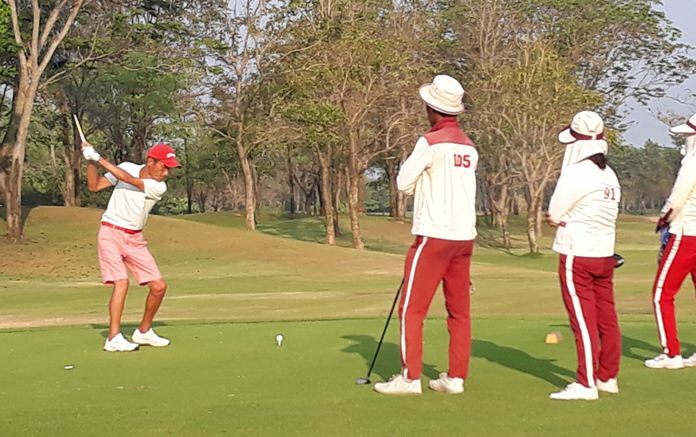 Kenny Aihara tees off on the 17th hole at Kabinburi Sports Club. A couple of ties made up the leaderboard this week and it was good to see our ol’ mate Peter Thomas back to form and on top with a fine 42 point round. This must be the first time in months Pete has shot better than his wife! David Johl shared the victory with his own 42 and at 37, Andy and Ishi made up the rest of the table. Don’t forget out Caddy Smile project, and today we had scratch golfer Richie McGhee claim the near pin with half the proceeds going to the caddies to help with their dental procedures. I sure am glad I booked these tee times 3 months ago because Khao Kheow is getting full signup sheets every time we get out here. Course conditions were, in a word, perfect. Weather was a bit on the warm side as we see the cool days of a Thailand “winter” a thing of the past. The tourists claimed all positions on the podium today and so out goes the theory of the advantage of local knowledge. Scoring was good and a couple of 41 point rounds belonged to Mitch Black and Yoshi Takita for their perseverance. Our Aussie mate Brad Gearie stood atop the third place block and nobody got our near pin! The vans were loaded, the bodies piled in and 16 of us hit the road up to Kabinburi. First stop was to the Serenity Hotel & Spa where Oliver greeted us for the February road trip. After a chill out there for 90 minutes, we trucked up the 33 for 12 clicks to the Kabinburi Sports Club for the first of our 2 rounds here. We had plenty of time to hit a tray of balls before our 1:00 tee time and get a few putts in as well. They have a new coffee shop here that has just opened with great coffee and smoothies to kick things off. The track was 6,241 yards today and the board said the greens were running 9 on the stimp, so fully prepared we drove up to the first tee. Apart from just a few wet patches, the golf course was in pristine condition. Weather was warmish on the front nine but the back was just great and a nice afternoon breeze made it even better. Blake Hanna was the dominant force for this initial round and ended up shooting an 80 gross, which included an amazing birdie, birdie birdie finish! Of course, one of those was the 16th par-3 that the near pin set him up for, costing me a drink! This time, I will happily oblige as I believe Blake set a TGC course record 45 points for a great win. As per usual, the day was capped off by our poolside wine and cheese party which the Serenity graciously hosted, and then into the restaurant for some of Oliver’s fantastic menu choices to end a great day on the road. Scoring today was not as good as day one but I suppose we can blame the previous night’s free flow wine for that! We haven’t seen too much of Bud O’Meara on the podium of late, but a handy 35 gave Bud third place. A guy who usually does score well is Kenny Aihara and today Ken added a 38 to his 41 from Thursday, proving that he likes this course. Dr. Dan Dietz done good. This is the first time Dan has played here and he was all over it. A 39 on the card gave Dan the win and his 42 on day one made for a strong 81 total, a score hard to beat on any trip. And then there was Mitch Black. The first par-3, he shanked it. The second par-3, he shanked it. The third par-3… well you guessed it, another shank. Then, on the final par-3 the 16th of 137 yards, he got our Caddy Smile near pin. Such is the cursed mistress that is golf! You never know, so never give up, nice going Mitch!